London has the music of the West End, while the States has New Orleans as the home of jazz. In Ireland – Doolin is recognised as the ‘capital of Irish music’ and the home of the traditional sound. Whether it’s a get-up-and-dance tune played on a fiddle, a lively tin whistle melody or the haunting sound of a pure Irish voice – Doolin is THE place to really embrace the heart and soul of magical Irish music. Since the very beginning, music has been an integral part of life in Doolin. One of the reasons was probably because of our remote location: music helped communities come together, and was also a way to make sure that the Irish language, as well as local music and dance, were kept alive. Today, it’s as prevalent as ever – with Doolin offering everything from nightly informal music sessions in the pubs and bars, to celebratory local music festivals. One of the most famous and personal ways of experiencing the music of Doolin is with a visit to Doolin Music House. This is the home of Christy Barry and his partner, Sheila – who have a long tradition of entertaining friends and musicians. While many people like the buzz of a busy pub, lots of guests prefer to listen to the sounds of Ireland in a more intimate, homely environment and atmosphere. This is exactly what Christy and Sheila have achieved – and it’s a wonderful opportunity you can enjoy any Monday, Wednesday and Friday evening, from 7.30. Sit around the fire and lose yourself in the experience, while Christy plays music till late, tells stories and discusses the history of Irish music. Often he is joined by his friend, James Devitt, and together they play traditional sets – while you are served a delicious meal of wine and local delights, such as Burren Smokehouse salmon and artisanal cheeses. The setting is perfect too: Sheila is an artist so her artworks decorate each room of the house. If a pub is more your scene – take your pick! We have four excellent and very lively pubs in the village – and each of them showcases some of the best talent in Irish music, each night of the year. One of the most famous pubs in Ireland, Gus O’Connor’s, has been the home of the craic since 1832 – and always has a collection of great musicians. McDermott’s pub has been in the family for four generations and really provides the full experience – great food, the best of beers and brilliant music. Some names to look out for are Blackie O’Connell on uilleann pipes, Mark Burke on the accordian and Eoghan Neff on fiddle. Fitzpatrick’s Bar offers you the comfort of homely, wholesome food, an open fire and relaxed atmosphere – while you’ll love the friendly staff and award-winning food of McGann’s Pub. Of course no great music spot would be complete without festivals – and our part of the world has its share! 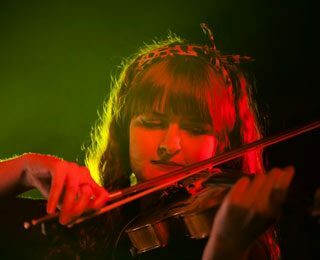 The Doolin Folk Festival is an annual event, taking place in the summer, and is a celebration of the rich connection we share with Irish music. One of Ireland’s best-loved traditional musicians was Micho Russell, and each year, on the last weekend in February, the Russell Memorial Weekend honours Micho and his brothers Pakkie and Gussie. Informal music sessions, set dancing, recitals, concerts and workshops are all part of the celebration. To take the sound of Irish to your heart is to open yourself up to the real soul of Irish life and the country’s culture – so step inside, pull up a chair, and join in!